Whether you are responding to a service station fire, chemical plant emergency, overturned tanker truck, derailed train cars or a meth lab fire, hazardous materials are everywhere. Having the ability to see the content level of an enclosed container at a safe distance is critical to the safety of the mission. Tracing a spill on the roadway in a rainstorm is an environmental necessity. Seeing the gases of a container at a safe distance is common sense. All of these firefighting tasks can be performed with a thermal imager. Two of the most common hazardous applications for using a thermal imager are tracking product spills and identifying product levels in containers. On these types of calls, it’s important to remain a safe distance away from the spill to protect the firefighting crew. Let’s take a look at a few of these firefighting situations and learn how a thermal imager could be helpful. Using a thermal imager can help firefighters locate a spill, track its source and determine the extent of contamination. If the spilled material is a different temperature than the ground or water on which it is spilled and the material stays on the surface, it should be visible using a thermal imager. Knowing the location and movement of a spilled product can be especially helpful in determining the proper placement for booms and dykes, as well as determining what, if any, evacuations may be required. This can be beneficial for identifying clear products or for tracking leaks in poor visibility, such as at night. If the leaking product has a different temperature than the surface onto which is has leaked, it should be visible with the thermal imager since the thermal imager detects temperature differences. This will also work with spills in waterways, as long as the spilled product is a different temperature than the water and it is less dense. For instance, a gasoline or diesel spill in a waterway can be quickly and efficiently identified and contained. By using the thermal imager to track the path of a liquid or a solid leak, firefighters can find the exact point of release and stop the flow of the product to make the containment efforts easier and faster. Firefighters can also identify the origin of a gas leak by using a thermal imager. Gases escaping a pressurized system cause an endothermic reaction, potentially making the area of escape colder than the rest of the system. During a search for a gas leak, looking for a cold section in the containment system could help firefighters locate the primary location of the leak. By scanning several cylinders or an entire piping system, firefighters can look for the cold spots to determine the source of the leak. The interior of the TI is not hermetically sealed, so decontamination efforts will not reach the interior of the TI. If this is a concern, you will have to dispose of the TI as hazardous waste. An option is to seal the TI in a clear plastic bag (polyethylene seems to work best) to protect it from the hazardous material and make decontamination easier. A thermal imager is a tool that should be used on every call. While a thermal imager does not help you remove the hazardous materials at an incident, it can help you locate the materials. 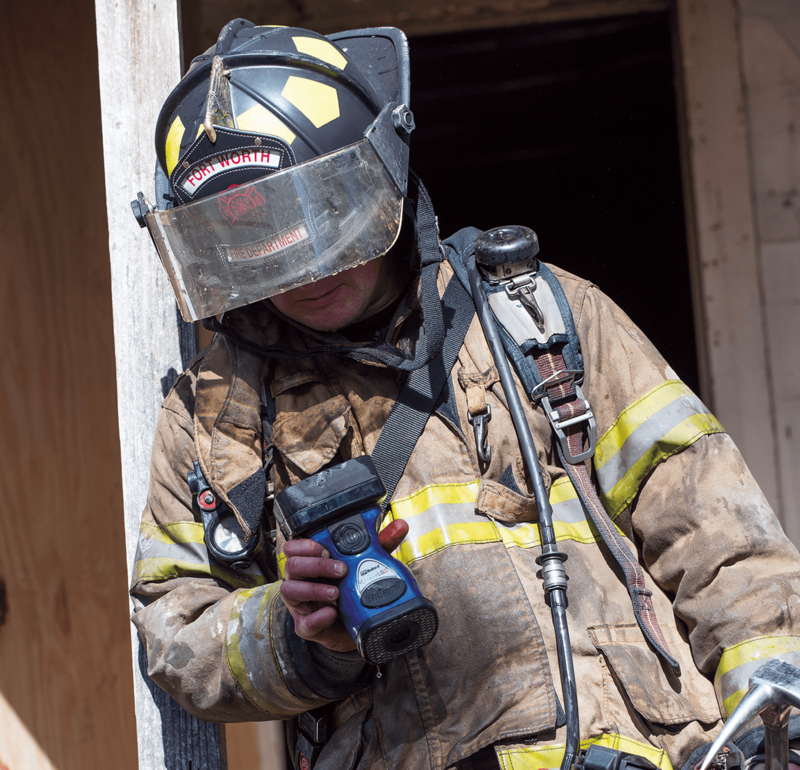 Higher resolution thermal imagers that offer digital zoom capability can help firefighters assess the threat and remain at a safe distance so they can be better prepared for what they’re facing. In addition, thermal imagers that offer features that identify or colorize the hottest elements can also be beneficial to discern threats or items of interest. incidents, such as these mentioned above, will find that a thermal imager can be a useful tool in their arsenal. For as long as there have been organised fire brigades, the enemy of firefighters around the world has been smoke. Smoke blinds fire crews in their initial reconnaissance, and impedes the rapid search for any casualties overcome in the choking fumes as the fire rapidly develops. Smoke also poses a constant hazard to firefighters as they struggle blindly to find the seat of a fire in large and in buildings with often complicated layouts. Fifty years ago most smoke was produced from the combustion of carbonaceous products and was bad enough. But with the onset of man-made materials so widely used nowadays in industry and home alike, the smoke products from fires pose firefighters with additional toxic and exposure hazards in what is already a dangerous and hostile environment. High levels of heat, humidity, the possibility of building collapse, fatigue and stress levels all contribute to making a firefighter’s task a very demanding and challenging one. Fortunately, science and technology has come to the aid of the firefighter in a number of ways during the past few decades. Thermal imaging and its valuable application is a particular case in point. Thermal imaging technology gives the firefighter the ability to see clearly through smoke, and in doing so can be considered one of the most significant and critical applications of science to modern day firefighting and rescue operations. In addition to their use when hazardous materials are involved in a fire or emergency situation, the use of thermal imaging brings a number of important benefits in firefighting in a smoke-logged building. A thermal imager colorizes the hottest elements of a fire to help firefighters see the dangers around them. All these four factors, taken either together or in part, are a considerable aid to the difficult and dangerous work of firefighting. But how does thermal imaging work? Everything in this world has a temperature and thermal imaging simply measures the infrared thermal radiation and temperature differentials between various objects and translates them through electronics into a visible ‘heat picture’. In simple terms, heat sources emit infrared wavelengths which are unaffected by smoke and will therefore pass unhindered through the thickest and most toxic ‘black stuff’ to provide firefighters with a clear view. Nowadays, thermal imaging cameras are a vital item of front-line fire and rescue equipment which will provide absolutely clear and reliable vision amid the thickest and most dense black smoke. When used during firefighting operations with breathing apparatus, the thermal camera user can see and direct the firefighting crews, readily locating unconscious casualties and speeding up the total search of the smoke filled building. 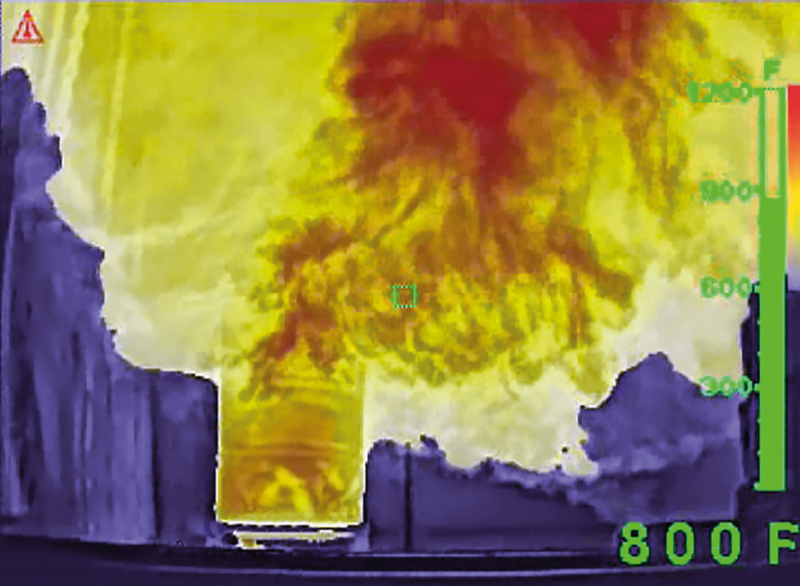 A firefighter using a thermal imager can also identify the thermal flow of hot gases from the fire source, together with hazards such as hanging wires, holes in floors and unprotected openings which could otherwise seriously endanger a firefighting crew working into a building ‘blind’ in smoke. An important element of the successful use of thermal imaging is being able to understand the displayed visual heat images. However, thermal images are dynamic – they are constantly changing as the thermal imaging user advances into a fire situation and the important information contained in the heat images have to be understood and evaluated as part of the overall fire and rescue operation. The interpretation of the changing heat images and successfully applying this important information to firefighting and rescue strategies and tactics calls for regular training, just as with any item of fire service equipment. The use of thermal imaging alone should never, of course, replace standard operating safety practices – thermal imaging should be regarded as very important navigational and information gathering tool, which in well-qualified hands can save lives, reduce the physical punishment taken by fire crews and make structural firefighting much more effective. The successful use of thermal imaging has undoubtedly made a significant contribution to safer and more effective international firefighting. Thermal cameras have indeed come a long way since their first use of the heavy and very unwieldy first generation units over 30 years ago, and who can foresee what further innovative developments are yet to come.